M-Day plus 4 | Me fail? I fly! Three men and a van took our worldly goods from Annandale to Marrickville on Wednesday. We were very unsystematic about telling our neighbours we were moving – it’s been just one incidental conversation at a time. Mostly people say they’re sorry to see us go, and seem to mean it. 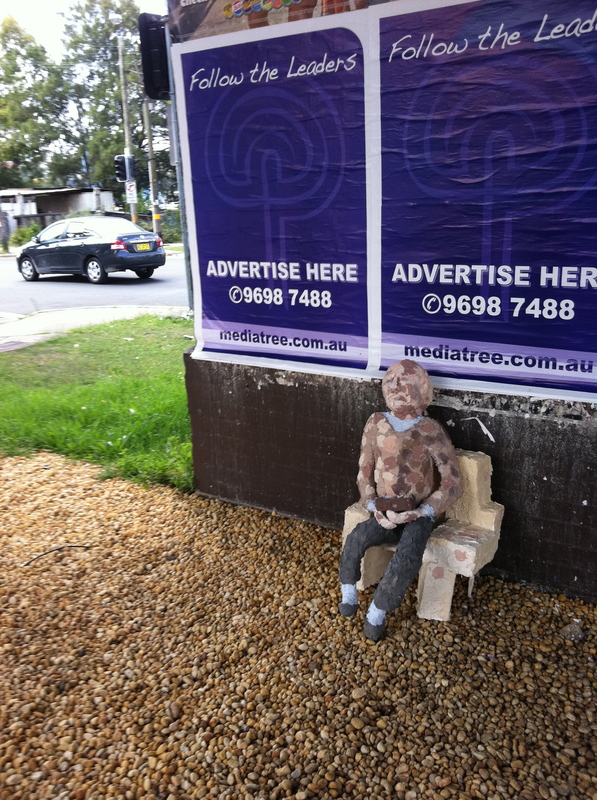 One man told me that when he was young and needing move out of his parents’ place, his wife came home one day saying she’d found a place for rent in Marrickville. ‘Marrickville!’ he replied, ‘Why not just go to Redfern?’ Just in case I didn’t get it, he paraphrased: ‘Why stop halfway? Why not go straight to the bottom?’ He went on after a beat, ‘It turned out we had the best two years of our lives there.’ So here we go: on our way to the bottom, or heading for unexpected bliss? The move was no more nightmarish than you’d expect. Nothing broke – though we did discover that a little Balinese soapstone sculpture in the garden had been knocked into the pond by an enthusiastic little dog and lost its head as a result. A dab of glue restored his head and a day in the sun removed most of the swampy smell. This entry was posted in Diary and tagged moving home. Bookmark the permalink. well done on unpacking all your books already! and glad to hear you’ve had friends drop by, and been able to walk to the movies in Newtown. and presumably you’re not too far away from the Gleebooks in Dulwich Hill? Congratulations again. It all sounds wonderful! Speaking of Redfern, sort of, my parents spent the happiest years of their lives in Waterloo. I think your little man looks very sad. I’m glad the ‘pretend’ dog has a home with you though. Didn’t get to say farewell before we left for Canberra. Things got hectic on our last day in Sydney. Deborah: The walk to Dulwich Hill is yet to come. I can’t tell yet how far anything is until I’ve tried it, but I think that might be a car ride. Mary Ann: Those days were hectic all around. I hope you’re safely home, and not too wet. Four days must be a record, I reckon – two years on and there’s still unpacked boxes in our shed…. We did cheat a little on the boxes, Kath. Half a dozen went straight to the attic (a wonderful feature of the house), some weren’t unpacked when I wrote this post (though they are now and have to be disposed of somehow), and one – of which I am very proud – had its contents emptied into the recycling bin when I looked at it and realised I would never look at its contents again, and a fortiori nor would anyone else. Congratulations. I am in awe!